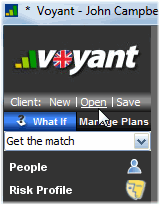 Client Case Access - Where in the software can all of the client files in your subscription be viewed? – Have a question? Access to all client files is available only when working online. To access these files, open the software, sign in, and navigate past any initial announcements. The Open Client Records dialogue will display. Note: If you are already working in a client case, you may access this dialogue at any time by clicking the Client: Open button in the top-left corner of the screen. The My Clients tab will show all of the client files owned by your user account. These are the files stored for your user account on the computer you are using. The files shown on this tab are those that would be available when using the software offline. Select the All Clients tab. All of your firm’s client records will be shown on this tab. The "Connected To" column will show who owns the file. Note that there is a limited amount of space in this column so you may move your cursor over the name of the owner to view the complete list of owners, should multiple users already have ownership of the client file.